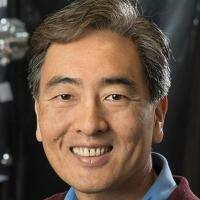 Jungsang Kim leads the Multifunctional Integrated Systems Technology group at Duke University. His main area of current research is quantum information sciences, where his group uses trapped atomic ions and a range of photonics technologies in an effort to construct a scalable quantum information processors and quantum communication networks. His research focuses on introduction of new technologies, such as micro fabricated ion traps, optical micro-electromechanical systems, advanced single photon detectors, compact cryogenics and vacuum technologies, towards a functional integration of quantum information processing systems. Maslov, D; Nam, Y; Kim, J, An Outlook for Quantum Computing [Point of View], Proceedings of the Ieee, vol 107 no. 1 (2019), pp. 5-10 [10.1109/JPROC.2018.2884353] [abs]. Cahall, C; Nicolich, KL; Islam, NT; Lafyatis, GP; Miller, AJ; Gauthier, DJ; Kim, J, Photon-Number Resolution in Conventional Superconducting Nanowire Single-photon Detectors: Experimental Demonstration, 2018 Conference on Lasers and Electro Optics, Cleo 2018 Proceedings (2018) [abs]. Nicolich, KL; Cahall, C; Islam, NT; Lafyatis, GP; Kim, J; Gauthier, DJ, Photon-Number Resolution in Conventional Superconducting Nanowire Single-Photon Detectors: Theoretical Predictions, 2018 Conference on Lasers and Electro Optics, Cleo 2018 Proceedings (2018) [abs]. Islam, NT; Lim, CCW; Cahall, C; Qi, B; Kim, J; Gauthier, DJ, High-rate Time-bin Quantum Key Distribution Using Quantum-controlled Measurement, 2018 Conference on Lasers and Electro Optics, Cleo 2018 Proceedings (2018) [abs]. Aragoneses, A; Islam, NT; Eggleston, M; Lezama, A; Kim, J; Gauthier, DJ, Bounding the outcome of a two-photon interference measurement using weak coherent states., Optics Letters, vol 43 no. 16 (2018), pp. 3806-3809 [10.1364/ol.43.003806] [abs].